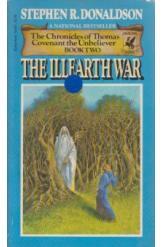 The Illearth War by Stephen Donaldson, Sci Fi. Book is in good condition, all pages intact. Mere days after his previous adventure Thomas is drawn back to the mystical Land, in which forty years have passed. Thomas must aid Hile Troy and the Council of Lords to once again protect the Land from Lord Foul, who has employed a devastating new weapon: the Illearth Stone. Book two of the Chronicles of Thomas Covenant the Unbeliever series.